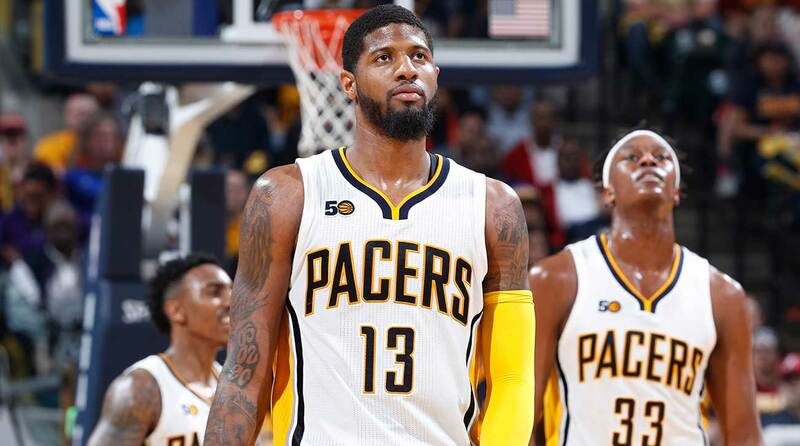 NBA Off-Season Preview: Should The Pacers Trade Paul George? Should the Pacers trade Paul George or should they try and convince their franchise star to stay? Indiana faces as challenging of an off-season as any team in the NBA. While the NBA playoffs are still going, the 2017 off–season is rapidly approaching for many teams with massive decisions to make. CBA expert Danny Leroux breaks down the major challenges and opportunities for the Indiana Pacers in The Crossover's NBA Summer Preview series. After sneaking into the playoffs only to be swept, the Pacers have an incredibly challenging off-season ahead of them. With Larry Bird gone, new GM Kevin Pritchard will have to decide if the Pacers should try and improve (with insufficient assets to change their fortunes) or rebuild and move key contributors. Jeff Teague, who was acquired last summer, hits unrestricted free agency for the first time and franchise cornerstone Paul George will likely follow next year. What should the Pacers do as they face a summer of crossroads? • Paul George: The 27-year-old star missed out on an All-NBA selection, which has a massive effect on his future. The snub substantially limits his options to maximize his salary in Indy. Since the new Collective Bargaining Agreement did not fully fix the league’s extension system, George’s most realistic path to signing a long-term deal this off-season was by qualifying as a Designated Veteran, which would have allowed the Pacers to pay him up to 35% of their salary cap starting with the 2018-19 season. While he could qualify by making an All-NBA team next season, it would be a massive risk for Indiana because if he fails to do so and declines his player option, their offer will not be much more lucrative than what other teams, most notably the Lakers, can offer. That means they need to get a firm sense of whether George wants to be a Pacer long term if the money is close to even. If not, Indiana should work hard to trade him and pounce on a strong offer because losing him for nothing would be devastating for the franchise. • Jeff Teague: Despite a successful first season with his hometown Pacers, Teague’s future with the team is largely dependent on what they do with George. After all, it would be hard to justify paying a point guard in his thirties big money unless Indiana is competitive in the near term. Since Stephen Curry, Chris Paul and Kyle Lowry are in a different strata and each could return to their current team, Teague will likely be competing with Jrue Holiday and George Hill, the player he was traded for last summer, to be the top (truly available) point guard in a loaded free-agent class. What makes their collective situation more compelling is that there are not any franchises on the cusp of contention with a clear need for a point guard. That said, some franchise will appreciate Teague’s value and force the Pacers’ hand early in free agency. • No. 18 pick: Selecting Myles Turner with the No. 11 pick in the 2015 draft worked out incredibly well for Indiana, but they will need to hit a little later this time around. Fortunately, they can use help at just about any position other than center so the front office should select the best available player with very few exceptions. NBA Mock Draft 4.0: Fultz, Ball, And Then What? 2017 Draft Assets: Own first (No. 18 overall) and second (No. 47) round picks. Potential Targets: If the Pacers choose to retain George and Teague, their biggest need is a swingman who can play the two. That player would need to play off-ball most of the time and hit jump shots, so JJ Redick looks like the most logical fit if they can meet his salary expectations. If Indiana decides a teardown is the better path, they should be extraordinarily patient since this is a fairly old free agent crop. Being responsible early in July could open the door for some team-friendly contracts because the big money will dry up relatively quickly and the Pacers would have playing time to offer. It is always hard to predict who will be left standing when the music stops but taking reasonable gambles on young players like Ben McLemore, Tyler Ennis and Shabazz Muhammad could be worthwhile, especially if either of the shooting guards has his qualifying offer rescinded during the free agency process. Pressure Scale: 9. George is the franchise’s best player and is just beginning to hit his prime. The Pacers have only missed the playoffs once in his seven-year career and that was the season he only appeared in only six games due to a broken leg. That said, the prospect of either losing him for nothing next summer (and potentially doing so after also committing serious money to Jeff Teague) should be even less palatable for them. An early decision would be helpful because it would also open the door for draft picks this season instead of the awkwardness of future selections that could become better or worse based on developments far outside their control. Another defining factor in that choice will be what other teams offer and both the Celtics and Lakers could play hardball for different reasons. Boston should be wary of adding a rental they cannot sign to a Designated Veteran contract while the Lakers can choose to wait out the process and make low bids to avoid repeating the Knicks’ mistake when they sacrificed significant resources to acquire Carmelo Anthony shortly before his own free agency. Either way, the Pacers will need to chart their course this off-season because waiting presents its own challenges. State of the Franchise: To Be Determined (Soon). While the Pacers can wait on Paul George, Teague and their cap space are entirely different matters and those decisions could affect George’s willingness to stay in 2018. After wisely moving on from Rodney Stuckey shortly before the end of the season, Indiana has the ability to improve their team this off-season even while owing almost $20 million to Monta Ellis and Al Jefferson next year. Their cap space should be enough to add a contributor or two but this free agent class is chock-full of big men that do not line up with the Pacers’ needs, especially if they retain Kevin Seraphin at his reasonable $2 million salary. Something else that should give Pacers fans comfort is that the team heads into the off-season with no bad long-term contracts on the books, meaning it will be easy to pivot if the front office decides focusing on the future is the best path. After years of success around Paul George, the Pacers have to decide how much uncertainty they are comfortable with and what would take to part with him a year ahead of free agency.